Thornton, K. (2015). Sharing stories of practice in self-access facility design and management. Studies in Self-Access Learning Journal, 6(2), 216-218. Welcome to the new column in SiSAL Journal. 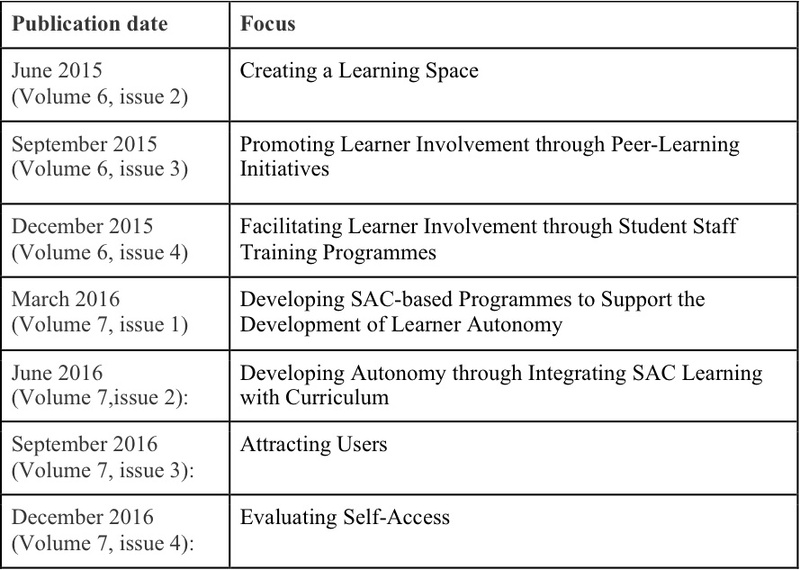 So far, this regular column has followed two different institutions as they reconceptualised aspects of their self-access services, in the case of Kanda University of International Studies (Japan), the self-directed learning modules offered through their SALC, and, in the case of the University of Bradford (UK), the reinvention of the self-access facilities as a social learning space. The upcoming column is a much bigger project. It will run for seven volumes of SiSAL Journal. Each issue will address a different aspect of self-access management, through reflective case studies from professionals who work in language learning spaces. This first instalment examines the process of creating and setting up a language learning space, and gives three different perspectives on this process. Firstly, Marina Chavez and Adelia Peña from the National Autonomous University of Mexico reflect on the process of establishing the mediateca, the name by which self-access centres are known in Mexico, at the Foreign Language Education Center there, in 1996, and the ways it has changed and adapted to its students and institution in the last 20 years. Their account emphasises learner autonomy as the primary theoretical concept which has driven the decision process in both the original set up and consequent evolution of the mediateca. Secondly, Kate Allert from the Hong Kong Academy of Performing Arts gives a personal account of setting up the Language Learning Center (LLC) there in 2012. Working in Hong Kong, Kate had the opportunity to visit many of the centres already well-established there, and talk to many experienced SALL-practitioners. While this perspective has been invaluable, Kate also emphasises the primary importance of local and institutional context in the process of establishing the LLC. While this may seem obvious, less experienced teachers, advisors and administrators, when faced with the daunting task of starting a new language learning space, may feel overwhelmed and be tempted to draw too much on the experiences of others working in essentially different contexts. In the third and final piece, Luke Carson, from Hiroshima City University, drawing on his experiences from being involved in three different SACs, reflects on the importance of employing full-time staff in language learning spaces that should be more than just resource centres. While acknowledging the good work done by peer mentors, student staff and part-time teachers, Luke argues that only professionally trained teachers, advisors and administrators who are given the time to devote to working directly with students and keep up-to-date with the field of SALL and SAC management can truly maximise learning opportunities for students. In closing, he offers some practical suggestions for those wanting to convince their institution’s management that it is worth the investment. I hope that the experiences and reflections detailed in these three articles will offer valuable insights into the process of establishing a language learning space, and the varied contexts in which these spaces are established. For future themes in this collection, please refer to the table below.